SafeSquid® has a Browser based User Interface, that allows users to configure various features in accordance with their respective Corporate Internet Usage Policies. To configure or change configuration, you must have access to the SafeSquid® Management Interface. 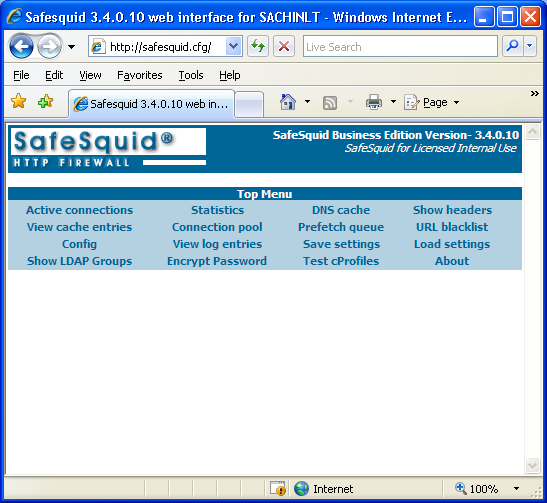 To access the Interface, you must configure your web-browser to use the SafeSquid® proxy server. For example - if you have set-up SafeSquid to listen on IP 192.168.0.130 on port 8080, then you should configure your web-browser to use proxy at 192.168.0.130 on port 8080. To set proxy IP and Port, you should open (Internet Explorer) Web Browser, go to Tools Menu —> Internet Options —> Connections —> LAN Settings —> select Use Proxy server option in the dialogue box then Specify your proxy server’s I.P. in Address option and Port (Default 8080). You should now be able to access the URL http://safesquid.cfg to configure various Features as well as monitor them from the same window. Mozilla users should open Web Browser, go to Tools Menu —> Options —> Connection settings —> Select Manual Proxy Configuration —> Specify your Proxy server’s I.P. in HTTP Proxy option and Port (Default 8080). You should now be able to access the URL http://safesquid.cfg to configure various Features as well as monitor them from the same window. Most features of SafeSquid® can be set, using this SafeSquid® Management Interface.